Mini retro versions of gaming consoles are all the rage, and following a move from Nintendo, Sony has launched pre-orders of their PlayStation Classic console—announced yesterday—in Canada. 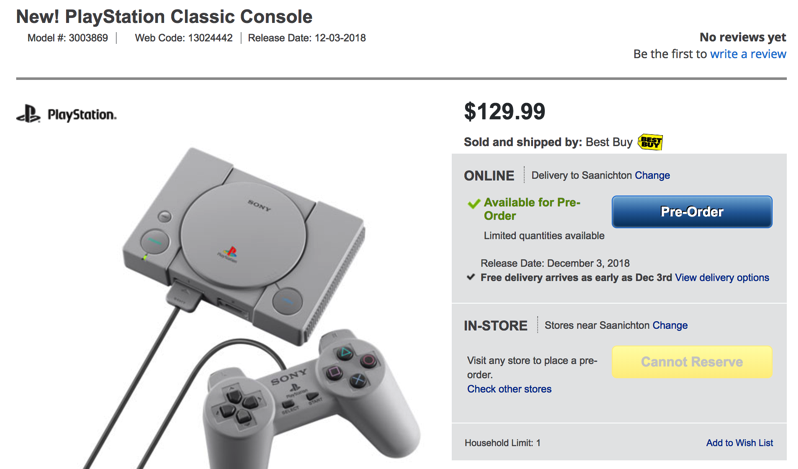 The Sony PlayStation classic is priced at $129 Canadian dollars and will be released on December 3, 2018. The console comes pre-loaded with 20 games, including classics such as: Tekken 3, Final Fantasy Vll, Jumping Flash, Ridge Racer Type 4, and Wild Arms. The main console is 45% smaller than the original PlayStation and includes two wired controllers, a virtual memory card and HDMI cable. Oddly enough, no AC adapter is included. With an early December release date, Sony looks to capitalize on holiday sales with its PlayStation Classic console. Let us know if you placed a pre-order today for a PlayStation Classic console.